Ever wonder how long it takes to get a book published? 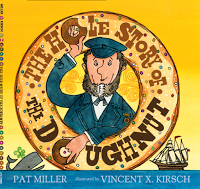 Author Pat Miller shares the timeline of her soon-to-be-released nonfiction picture book, The Hole Story of the Doughnut, on the Rate Your Story blog. Note how many times Pat sought out critiques and revised her work. If you want more of Pat's insights and enthusiasm consider signing up for her nonfiction conference. 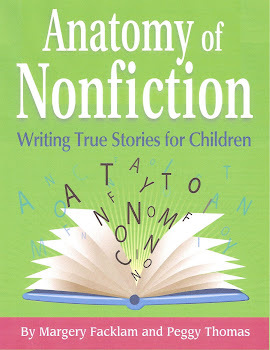 This year, NF 4 NF (Nonfiction for New Folks) will be held on September 22-25 in Rosenberg, Texas. Recently, Scholastic pulled the picture book A Birthday Cake for George Washington because of the way slaves were portrayed. I have not seen the book, nor do I know if it was fiction or nonfiction. But I hope this incident opens up a discussion. Should difficult subjects be dealt with in picture books, and if so, how? 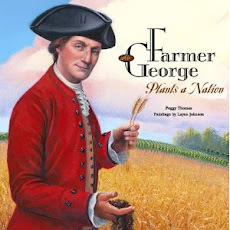 When my book Farmer George Plants a Nation came out it received good, even starred reviews. But one reviewer criticized an illustration because a slave was smiling. I know that I did not intend to portray slavery in a "happy" way, and I know that the illustrator, Layne Johnson, didn't either. Our goal was accuracy. The book wasn't even about slavery. The fact that I was writing about Washington's farm meant that I had to address slavery, and illustrations would include enslaved workers. I chose to address slavery in the back matter because including it in the narrative would have shifted the story away from my intended focus. And we all know that a picture book has to have a tight focus. I didn't mean to slight the issue, and I hope it isn't perceived that way. Was I right to do that? I don't know. It was a judgement call on my part. Now that I look at the book, I see that there are actually three smiles. Two black women are talking to each other and one is smiling. That seems okay. On another page, a man is behind a plow and smiling at the back end of the mules in front of him. I think that is okay, too. The only questionable smile appears on the man pulling a handcart. He is looking in George's direction, and George appears to be smiling back (although now that I look at it, he looks rather smug... or wistful... yeah, we'll go with wistful). Is it wrong to have a slave smile in the direction of the master? Would it ever have happened? I think one questionable smile out of the 28 other black figures that I counted in the book isn't bad. A smile is one thing, but what about invisibility? Is that any better? The other black figures in the book have their heads lowered, or shaded by a hat brim, or have a neutral face, or are so far in the distance that they are indistinct. Blurred. They are the cultural back drop. That's accurate, but is it really better than a prominent slave (yes there were slaves with higher standing) participating in the forefront? My book about Thomas Jefferson doesn't have a single image of a slave, nor are they mentioned in the text, but because of TJ's baggage I felt obliged to address the issue in the back matter there, too (More to appease critics than educate young readers, if I'm being honest). I have always admired the monumental work that a nonfiction illustrator does. I just have to write, "He guided a plow." The illustrator has to figure out what that plow looked like, what the men or women would look like, what they would wear, what the landscape would be, the types of plants.... The list of all the things that could go wrong is endless. So I am grateful to Layne Johnson for his sensitivity and attention to detail. All I know is that slavery is a difficult subject to write about when it's the main topic. It is also difficult to address when it is the cultural backdrop of a smaller story. Should we not tell those stories? Or should we come to some understanding of how we as authors and illustrators can walk that fine line of educate and entertain? My heart goes out to the author, illustrator, editor and art director on the project. They walked the fine line, and unfortunately for this project,... they fell off. The best part about being a writer is that it gives me an excuse to do whatever the heck I want to do. That includes taking off shortly after the holidays to spend four days "Down on the Farm." When Julia Recko from the American Farm Bureau Foundation for Agriculture (AFBFA) asked if I wanted to spend a long weekend getting to know a bunch of farmers, I said. "Of course I do!" I didn't have any immediate plans to write about farmers, but sometimes research opportunities come to you, and when it does, grab it. I wasn't the only one to jump at this opportunity. Eleven other children's authors and illustrators were there: Albert Monreal Quihuis Loreen Leedy, Sandra Neil Wallace, Susan Grigsby, Eric Ode, Lela Nargi, Lisl Detlefsen, Lizzy Rockwell, Michael Spradlin, Shennen Bersani, and 2009 Miss America Katie Irk. 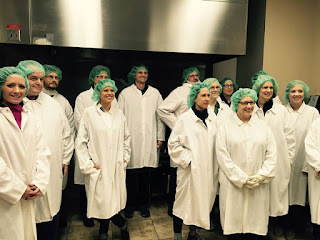 The first day we toured a meat processing plant (not a slaughterhouse!). Other than the freezing temperatures and hairnet it was like touring any other processing plant. Highly efficient and organized, beef was trimmed to chef's orders at a rapid rate. I was struck by how many people worked there even though it was partially mechanized. No machine can take the place of a real person making sure each filet is measured properly. That afternoon we toured a family-owned cattle ranch. The black Angus trotted after our hay wagon eager to get a snack. Several week-old calves shyly peeked around their moms to see what the fuss was about. Although I could have stood in the pasture for hours watching the animals, the real stars of the show were Riley and Reagan Rowe, the farmer's granddaughters, who were proud to show off their 4H projects. At 14 and 9, these two girls were more poised and well spoken than most adults. And they knew there stuff. I had no idea 4H kids had to keep such careful records of expenses, depreciation of equipment, and send letters to potential buyers. Sounds similar to what we have to do as writers! The next day we were set up on a "blind date" of sorts with a farmer. I was very nervous when I met Carlton, a farmer from Iowa. He lives on a Heritage Farm that has been in his family more than 100 years. He and his wife grow corn, soybeans, and finish cattle, which means they buy calves and fatten them up for market. We talked about new technology and why people are so suspicious of innovation in farming. Did you know that by the year 2050 that the world population will be 9 billion people? Yet, the world's farmland is decreasing. That concerns Carlton and other farmers. When I asked him if he thought about the weighty fact that he was responsible for feeding the world, he said yes, he does think about it. I was humbled. I just write children's books. I didn't have any plans to write about farmers before, but now? Who knows. I have a notebook full of ideas. And I'm curious to know more. That's what happens when you put yourself out there. It makes you think. So take a leap. Take a trip. Talk to people. You'll be a better writer, and a better person, for it.